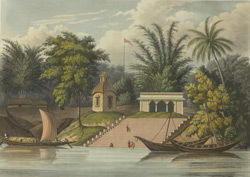 This is plate 3 from Charles Ramus Forrest's 'A Picturesque tour along the rivers Ganges and Jumna, in India'. Forrest was an East India Company official who made excursions along the rivers, producing drawings "attentively copied from nature, and in many instances coloured on the spot, ... while the magic effects of the scenes represented were still impressed on [his] mental vision". Forrest writes that he once had occasion "to proceed on duty from Calcutta to Berhampore on the Cossimbazar river, a branch of the Ganges, which, uniting with another, the Jellinghy, at Nuddea, forms the Hooghly river, which descends to Calcutta". He stopped near the village of Cutwah, situated on the right bank of the Hoogly. It has many ghats or flights of steps leading to the river, one of which is shown here leading from the temple. Some of the larger boats used for the transport of merchandise are also depicted.